Explore whether a film script can be written in such a way that it does not necessarily follow the standard hero’s/heroine’s journey structure of traditional Hollywood films, but is written so that the structure reflects the essential characteristics of the protagonist him/herself. The focus of the seminar is to examine how uncovering the protagonist’s underlying motivating force allows the screenwriter to create a motif or fractal which resonates throughout the screenplay. It will show how the chosen fractal can add interpretative depth, substance and subtext to the narrative, and can even shape the final form of the script. 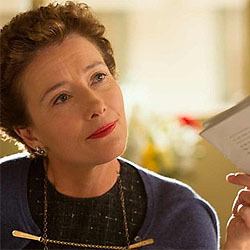 Clips from Saving Mr Banks will be shown to illustrate how to find a motif which dictates structure and Janet will also use a case study of her own screenplay in which she found the perfect fractal for her protagonist, Mary Wollstonecraft, in A Hyena in Petticoats. In developing this project, Janet developed a table which illustrates the structure of the script, taking it beyond the traditional three-act structure into a hyper-structure with the use of fractals. Extracts from the screenplay will be examined to see whether the motif has indeed added substance and subtext to the narrative. The hyper-structure table will be given to attendants of the seminar. The theory discussed in this seminar is due to be published by Palgrave McMillan in the UK in 2019 as Screenwriting for Substance and Subtext: From Mise én Scéne to Misé én Abyme*. *This is the literary term for “Fractal”. Janet van Eeden is the Head of Post Graduate Studies at AFDA Durban’s Film, Television and Performance School, which is one of the top schools of film on the African Continent.